Back in the AtoZ Challenge 2017, I completed the 26 blocks you see below, and then some. The directions often allowed you to cut enough fabric to create 2 blocks. So I thought, why not?! I’ll have extra in case of mistakes. Well, I surprised even myself and had very little waste. So much so that there isn’t much of any of these fabrics left. There’s a familiar ring to this for me. I seem to have a knack for having just enough to do the blocks. Can you say ‘throw caution to the wind’? I must be good at that. I also took a vote as you see in that above photo. I wanted to know which color everyone preferred as the sashing (the strips connected the blocks). I totally agreed that the blue was pretty and between the comments and FaceBook, it won the vote. —-the color will be gold. another challenge down in the books. It was not a sure thing even as recent as January 1st. I bought 3 separate quilting books with A to Z blocks over the last year. Two were in January. And still I was not sure until the day I signed up which was the first day of sign ups. Talk about indecisive! I brought new meaning to procrastinating this year. Another year to shuffle job, family, blogging and taxes. I complained a time or two about how many hours a day that I work. Some don’t really consider what I do as work. I won’t go on about that but I would say being self-employed anyplace and maintaining that career for 25+ years is validation enough to call my job work. Dealing with family is mandatory. Not much ‘splainin’ to do there. Blogging with my subject matter we’ll deal with in the next paragraph. And then the Taxes. Self-employed = itemization. That means keeping each and every receipt through the year and (hopefully) not waiting til the last month to go through them to tally up expenses. Unless you’re in this household. Ug! Will I ever learn?? Hopefully this year has taught me to be on top of the receipts if nothing else. Prayers sent were greatly appreciated. Another year to expand my quilting experience. The picking out the fabric seems simple enough. The biggest demand of time is the cutting. The sewing didn’t even take as long normally. I say normally because a few times there were blocks that were a true challenge for me. And I loved my fabric choices this year. When each block was completed, I really liked each one of them. But the down-side to my own 2018 A to Z Challenge was the fact that I did not truly like my block arrangement or the blocks when they were combined period. Each one stood alone wonderfully. But the quilt top left much to be desired by yours truly. I blame myself for not buying a little more fabric to fix that “one” in the middle–the Indian Square block. I will go ahead and leave it as is and hand quilt it. It’ll be a conversation piece for sure. But if there’s a quilt theme for me next year, it will be done way in advance, with ample fabric, and a different color scheme. To reward myself, I purchased a t-shirt this year for my 5th year completion. Thank you for making these an option each year. It came in the mail Monday. Thank you to everyone who dropped in, liked, commented or supported me in any way during this challenge. This includes family and friends. I’m truly blessed to have such a phenominal circle of well-wishers. And finally, thank you to all our hosts and co-hosts this year who went above and beyond to make this the best and most cohesive challenge yet. I truly appreciate all your time and energy invested in making our challenge a possibility this year and in years past. I’m convinced it’s a labor of love. A love for encouraging writers from all walks of life. I’ll be nominating you for sainthood just for the record. 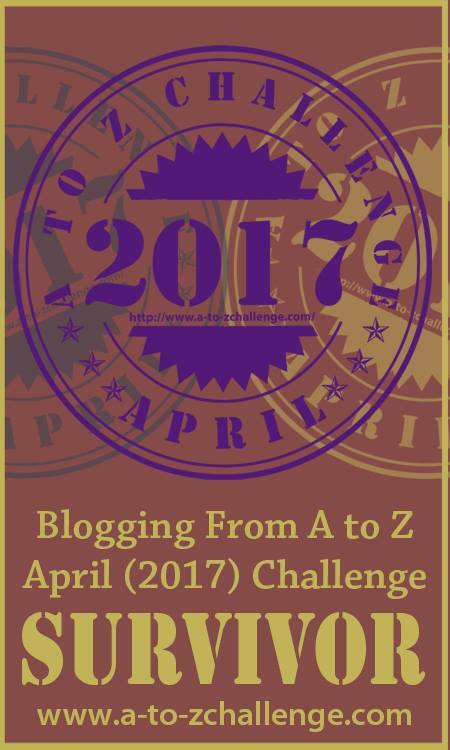 Click here to see the latest information from the 2018 A to Z Blogging Challenge. There is a link to the Master List for this year, a survey, reflections link and coming up is an A to Z Road Trip. I hope you can check it all out. Wagon Tracks is a combination of familiar patterns. The 2 patterns I speak of are the 4-patch and the half-triangle square. With these two it’s easy to mix and match to come up with alternatives. For this block, the name selection is easy to understand. It has direction and appearance as a ‘track’. 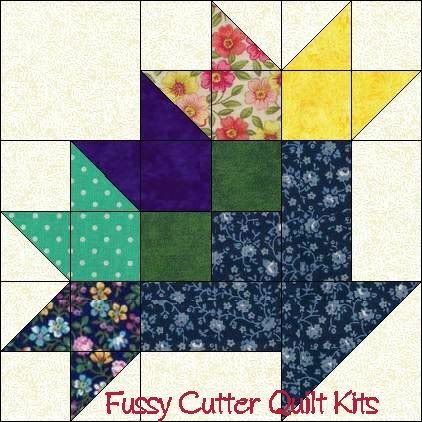 An advantage to this type of quilt block is that it can be easily chain-pieced for quick assembly. The photo below demonstrates how a series of similar pieces can be sewn in a continuous fashion for efficiency. Less cutting, stopping and starting; more uninterrupted sewing. The final product is this eye-catching block. It resembles a Jacob’s Ladder pattern to me. Maybe I’ll find the one that I finished q to show you sometime. For now I’m pressed for time. Mother has a pretty major surgery Thursday morning and I’m hoping to have a chance to post before too late in the day. It is an hour drive to the hospital and she’s guaranteed a 3 to 4 day stay minimum. The you’all is a continuous word that flows naturally. It’s not ya’ll as in the deep South. More of a roll off the tongue word that sounds like it’s supposed to be one word. I’m pretty sure my sister and I will hear this inquiry during our extended time in the waiting room waiting on Mother’s surgery. And our ‘parts’ is our town or the closest one to us. I’ve encountered a few blocks while searching books this past couple years that are called ‘Unnamed’. They have good reason I’m sure to leave them without a name. But for me this one would be called “Knocked It Outta the Park”. I was fortunate enough to locate a YouTube tutorial on setting in piecing for quilt blocks. It was provided by Fon’s and Porter and to them I want to shout out a huge Thank You! After watching it, I had success, Finally! There may be hope for me yet on that unique Ohio Star block after this little teaching aid. I need to mention that I don’t have the little tool they promoted in this video. But I have to say that after sewing since a youngster, I’m pretty confident in my ability on where to place a 1/4 inch mark. I have photos to prove it. The end of the stitching as directed. And this is the way it’s supposed to work….no puckers and lays flat. Mitered /set-in piecing/ Big hallelujah! And finally the whole block picture. I’m using this term to go along with today’s topic. I could have said I took a gander at that YouTube video. But instead I mentioned watching it. 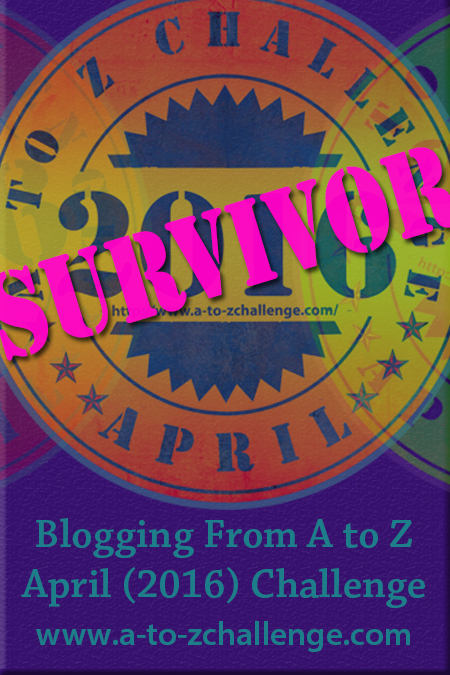 Glad you all took a gander at my blog post today and I hope you are all having great success in this year’s A to Z Challenge. This quilt block is going to be in the top 3 favorites for me personally. I am partial to these basket-esque blocks and this one gives the appearance of a mirrored image basket. The fact that its title doesn’t reflect that is no matter to me. It still has the style I love. And it’s not difficult; so there’s that. Something I haven’t discussed is fussy-cut quilt blocks. The Queen’s Crown could take on a whole new bejeweled look with some changes in the points. For a scrap fabric hoarder like yours truly, this is definitely something I will consider. The only decision left is whether to go for a saphire, emerald or topaz colored ‘crown’? Or maybe all the above such as in the picture below I’ve found via Pinterest. Quitchur makes the Ozark slang list for letter ‘Q’. We have another instance of combining two words for one. Quit your is replaced with the slang and said when you are in a hurry to complete a statement. Such as ‘Quitchur lollygaggin and hurry up or we’ll be late!’ I hope you can assertain from the context that lollygaggin is a synonym for taking your sweet time. I am guilty as charged for using this one. The danger for not listening to this first attempt at speeding them up is that in the next breath, Quit Your comes out very clearly and you know you are about to get left behind.